SPEC Cluthes offer the finest range of flywheels and clutches. The clutch that we are using in our Pantera is manufactured of the highest quality materials and to the strictest tolerances. SPEC is known to the racing industry as the best flywheel and clutch company around. 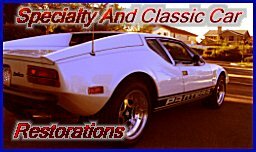 Check out SPEC’s website and view their vast line of products and choose the appropriate products for your vehicle. Upgrade your car with a SPEC Clutch and Flywheel and you will never go back.